Some of the many patterns and colors of Bolga Baskets. 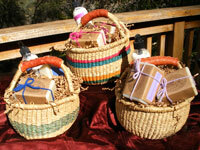 Gift Baskets have 2 bath soap bars and 1 lotion. You can order various combinations of over 30 varieties. Other product combinations are available upon request. Bolga Baskets are both unique and practical. The baskets are hand woven from natural elephant grass and are crafted in northern Ghana. Handles are covered with supple goat hide. 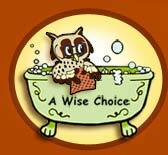 These market baskets are very useful and will last for years.